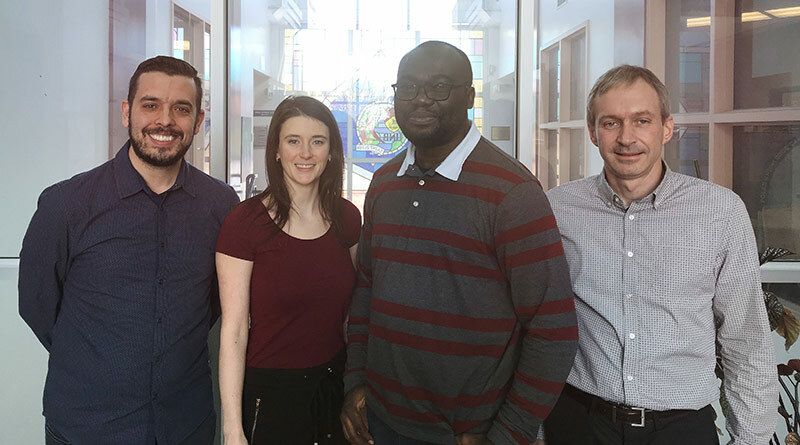 MBA candidates from the faculty of business at UNB Saint John recently received awards for academic excellence, entrepreneurial pursuits and service to their community. Kristen Duplessis, Obiechina Azubike and Paul Logan each received the Walter and Joan Flewelling Memorial Award, worth $5,000. Daniel J. Mello received the Kerry McLellan scholarship, worth $1,000. Ms. Duplessis, originally from Saint John, has been working in cardiology technology at the Saint John Regional Hospital for the last four years and spends her extra time volunteering with various local sports organizations. Ms. Duplessis has always been passionate about healthcare and wellness and believes that receiving this award will help her to achieve her goals. Mr. Azubike, from Nigeria, is currently the vice-president of administration and communication for the MBA Society. He also serves as one of the graduate student representatives in the student technology fee committee. Mr. Logan, originally from Halifax, decided to come to UNB to pursue an MBA after working in the areas of internal audit, policy, compliance and management review for various departments in the federal government. “I hope to continue working in business analytics and process optimization in an organization that values engagement and growth,” he explained. In addition to his academic pursuits, Mr. Logan is a busy father of two who spends countless hours coaching youth baseball and basketball. Mr. Mello, from Brazil, is the current president of the MBA Society, as well as a project management instructor for online courses.